As a tribute to the larger than life action extravaganzas of the 1980’s, The Expendables was merely adequate. It had its moments, but it wasn’t the hard hitting, ultra-militaristic alpha male free-for-all that many fans were hoping for. It felt especially safe after 2008’s blood drenched Rambo entry. One could almost feel Stallone pulling his punches until the CGI enhanced carnage in the final reel. Well, the good thing about sequels for such films is that they offer a major chance for improvement. The era of body building super soldiers has yet to receive the proper tribute. 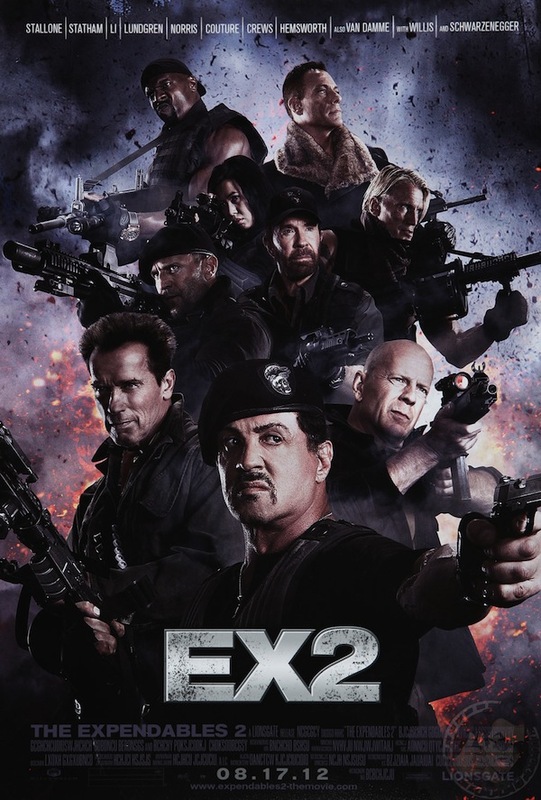 If the poster is any indication, The Expendables 2 will offer much more of the same, only bigger. The cast has swelled to include Jean Claude Van Damme and Chuck Norris. Both are second or even third tier action heroes when compared with the likes of Stallone, Shwarzenegger, and Willis. Still, they played a big part in defining their particular era, and that alone warrants their inclusion. Jason Statham and Terry Crews are also back. Jet Li is noticeably absent, not that it will matter much since he was barely present in the first film. Shwarzenegger is featured prominently, though there is no indication that his role will be anything more than a glorified cameo. There’s no way to tell until a proper trailer is released, and even then, we won’t really know until opening night.